The DAICON Girl is main character in the opening animations for the DAICON sci-fi conventions held in Osaka, Japan. The DAICON III animation features the girl as an adolescent, who is visited by the Science Patrol from Ultraman, and asked to deliver a glass of water to a dying daikon plant. Along the way, a slew of sci-fi characters attempt to stop her mission, but her superhuman strength and multipurpose backpack defeat her pursuers. Upon pouring the water onto the daikon, the plant revives and transforms into The DAICON, a large space ship. The young girl is then beamed onto The DAICON and is made the captain of the ship. The ship then departs into space. 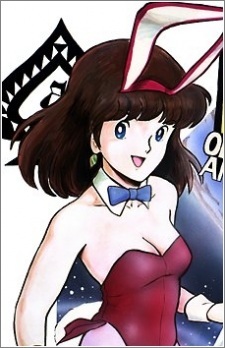 The DAICON Girl returns in the DAICON IV opening animation, now matured and as a bunny girl. For reasons unspecified, she begins to fight a multitude of sci-fi and fantasy characters, ranging from both Japanese anime and manga, and Western comics and cartoons. She eventually jumps on a flying Stormbringer sword and begins flying through various dimensions before jumping off the Stormbringer. The Stormbringer then splits and begins destroying the Earth, creating mountains and rivers in its place. The DAICON Girl is then seen in an empty space with sakura petals drifting by. A beam fired by The DAICON travels over this new land, instantly creating plant life of all kinds. The DAICON Girl's fate and whereabouts is left unknown.